From robiola-oozing mortadella packets to gooey stuffed burgers, these recipes make the most of grilling with cheese. Star chef Mario Batali's terrific wraps are best with Italian mortadella and creamy, fresh robiola cheese. Make this cookout snack with any size peppers. As they blister, the cheese mixture tucked inside turns warm and gooey. 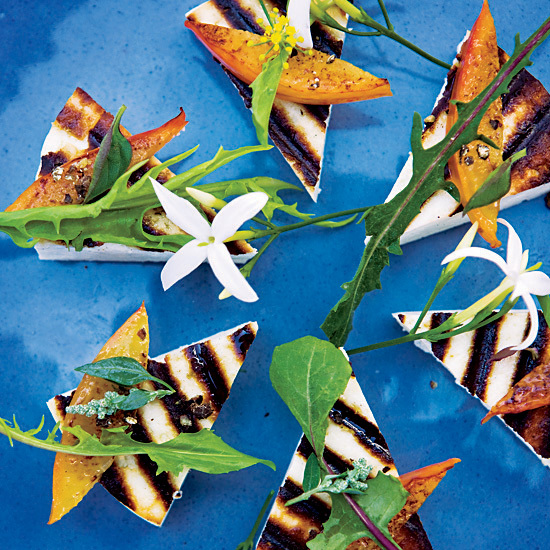 Chef Michael Psilaki's version of saganaki (fried cheese with lemon) uses the milky Greek cheese manouri, which is made from the whey that's drained off during feta production. Pure ground chile adds fantastic heat to sweet grilled corn coated in creamy cheese. This incredible white pizza features garlicky pistachio pesto and four cheeses: mozzarella, Fontina, provolone and scamorza. Top chef alum Stephanie Izard tops these warm, melted cheddar cheese toasts with tangy relish. These fast, 20-minute burgers are stuffed with spicy pimento cheese before grilling, then topped with chile relish.